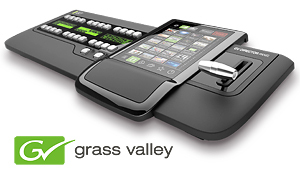 During IBC 2013, the international broadcast technology forum, Grass Valley announced several new developments. Most notable of them a new line-up of LDX series cameras - LDX 80 Compact series camera heads offering offers the same feature set, format support and performance and uses the same C2IP camera control system as the LDX range, which offers unparalleled image quality, flexibility and efficiency, but at a lower price. At the forum Grass Valley announced yet another completely new development - CommandCenter software application, designed with advanced functionality to configure, control, monitor, and diagnose a range of broadcast infrastructure devices on-site or remotely. 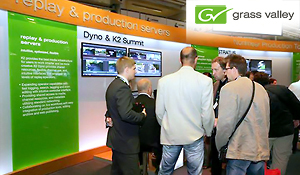 Grass Valley offers many other new development such as: the latest version of GV STRATUS, its widely used nonlinear media production tool, which just won prestigious CSI award, K-Frame software update; new ShareFlex network collaboration functionality for K2 Dyno replay system; EDIUS 7 - new version of popular video editing and production software version; updates for GV Edge platform; extended format support for K2 Summit server systems; and GV Director innovative nonlinear live production system with integrated multiviewer support. 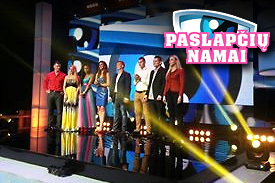 This summer to support production of the reality show Paslapciu namai Hannu Pro Vilnius supplied a EUR 20 000 worth Blackmagic Design signal processing, video capturing and output equipment for TV Manija. Supplied equipment was first used at the presentation of the new television show what was shot at Gariunai shopping area and broadcasted live on TV3. Later Hannu Pro Vilnius and ProRent, the leading Lithuanian professional production rental company, agreed on providing Sony CineAlta series PMW-F55 4K Digital Cinema camera fully equipped with all required accessories. As part of bigger EUR 300 000 valued tender for Vilnius Vocational School of Railway and Business Services Hannu Pro Vilnius provided 3D video production and streaming solution. 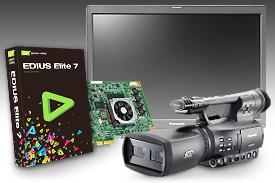 This includes a Panasonic AG-3DA1EJ twin lens (true 3D) camcorder equipped with Cartoni, Camrade, and SWIT accessories; wireless Beyerdynamic microphones and receivers; a Panasonic BT-3DL2550 3D monitor with dual SDI inputs; a Grass Valley STORM 3G Elite and EDIUS based nonlinear video editing system; a Thecus network area storage system; and a Barix audio over IP solution. Customer opted for EDIUS based non-linear editing solution as EDIUS really shines as most efficient tool for 3D editing thanks to its unique features, which allows capturing, editing and playback of true 3D video. EDIUS 3G Elite allows full monitoring of 3D video when connected to a Panasonic BT-3DL2550 3D via two parallel SDI cables. In June complete mobile production solution was delivered to University of Tartu Viljandi Culture Academy. 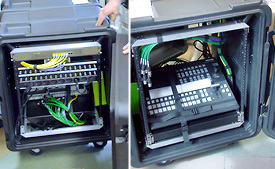 Supplied production system is built around Panasonic AV-HS410 multiformat HD production switcher and allows handling of up to 12 HD video feeds, and also includes Clearcom HME intercom system and Blackmagic Design HyperDeck studio recorders, all mounted into mobile production rack unit. At the same time Hannu Pro Tallinn delivered Lupolight and Ianiro lighting equipment, which will be installed at customers production facility as soon as construction works are finished. Successful cooperation with Viljandi Culture Academy started earlier in May, when Hannu Pro supplied to University of Tartu two large venue video projection systems based on Barco technologies valued more that EUR 50 000. Hannu Pro proposed full mobile visual solution including two high-end Barco RLM-W8 8000 lumen WUXGA Full HD capable 3-chip DLP projectors. Now, as this project is completed, Viljandi Culture Academy at the University of Tartu also received full range of accessories: four high quality Barco lenses; two flight cases; two Barco piedestals; two AV Stumpfl Monoblox screens, as well as new AV-HS410E production mixer and Blackmagic Design HyperDeck i/o equipment based mobile production station. To assist mobile production Hannu Pro Tallinn supplied several AVIWEST DMNG systems to Nelonen and MTV3 in Finland. Nelonen, the second largest private broadcaster in Finland, upgraded its wireless transmission systems with another AVIWEST DMNG transmitter - most powerful DMNG PRO180. 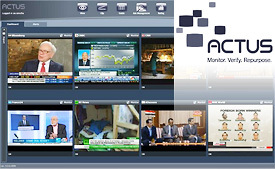 Now the company is able to send 2 simultaneous streams of audiovisual content to its production centre, what significantly improves news and programme production workflow allowing fast news updates directly from location. Nelonen’s receiving server DMNG Studio is prepared for 4 input streams - thus the system is really future proof and ready to accommodate unexpected feeds from abroad. Moreover, AVIWEST is open providing DMNG transmitters rental for their clients all over the world, wherever hot news is happening. In spring Tallinna TV - Tallinn city council public broadcasting company - finished their Pubitronic channel-in-a-box system upgrade and now it can broadcast from the new state-of-the-art Grass Valley K2 Edge Elite full-featured integrated play-out platform. Upgrading to a Grass Valley K2 Edge Elite platform with integrated TX/MAM server system provided Tallinna TV a fully controllable play-out workflow. Supplied system also offers many powerful features such as real-time database integration (RTic), channel design using Channel Composer, scheduled recording and many more. During the first half of 2013 Hannu Pro Tallinn was busy implementing a number of projects for broadcasters, television companies and educational institutions. At the beginning of the year Hannu Pro Tallinn supplied an advanced Actus compliance recording system to Elion - one of the largest telecommunications provider and the only IPTV operator in Estonia. 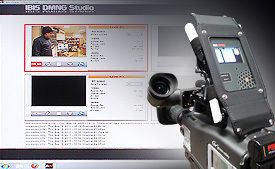 Supplied system allows compliance recording of 3 TV channels directly via IP input option. In April Levira - Estonian State broadcasting company - opted for the expansion option for its Actus compliance recording system. Levira received another 10 HD licences for channel monitoring and compliance recording totalling the number of monitored channels to more than 20. During the first half of 2013 Hannu Pro successfully took part in several tenders called by Latvian State Radio and Television centre (LVRTC) and won rights to provide services and supply equipment. As agreed Hannu Pro will provide post warranty services and maintenance for Thomson's digital MPEG4 broadcast equipment, maintenance and repair services for microwave network equipment, supply new devices and equipment for microwave network, as well as provide patch panels, coaxial components, and test and measurement equipment for antenna and feeder systems. Recently Hannu Pro also took part in LVRTC's roadmap development for digital broadcasting transition for first Latvian public multiplex. 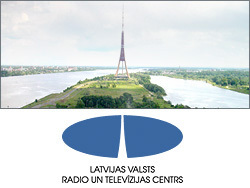 According to legislative acts on January 1st, 2014 LVRTC will take over broadcasting of first public multiplex and will broadcast signals to whole territory of Latvia. In order to foster this transition cutting possible glitches to a minimum Hannu Pro engineers have engaged in consultancy partnership sharing their knowledge base to LVRTC employees. In July Hannu Pro established Hannu Pro Caucasus – a new branch to provide system integration services in Caucasus region. The central office of Hannu Pro Caucasus is located in Tbilisi. "Countries of Caucasus are interesting developing area, worth taking a closer look, and we are excited expanding our activities there", says Kalvis Baumanis - Hannu Pro Member of the Board. More than 15 million people live in the region with average GDP comparable to the several European countries. However market specifics of the region require a special approach and that is exactly what Hannu Pro can offer. Hannu Pro has gained great deal of experience in designing and deploying TV, Broadcasting, IPTV/OTT solutions and services. Now we are happy to share our knowledge to help clients in Caucasus region with consulting and system integration. The second round of Hannu Pro manager training session took place in early July. During training Hannu Pro managers and service engineers extended their knowledge in project management including project cycle structure, risk analysis, project execution and supervision. Training was organized as two-day session. On the first day project managers learned theory and during the second day they put their recently gained knowledge into effect implementing a small test project. At the end of this training session managers analysed the results of the test project implementation and internal collaboration. Training clearly reached the aim and helped project managers to broaden their knowledge in project management. 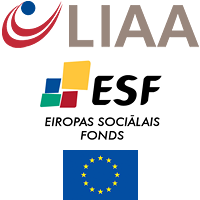 Training was organized in cooperation with the association Latvian Chamber of Commerce and Industry and with the support of European Social Fund (ESF) and Investment and Development Agency of Latvia (LIAA). To meet the market demand, Blackmagic Cinema cameras providing high quality full HD (1080p) and 2.5K RAW images and video recording in to a solid state disk drive (SSD) now are included in Hannu Pro's professional production tools offer. Blackmagic Cinema camera incorporates 2.5K capable matrix and provides ultra wide dynamic range cinematographic images. Depending on the camera model Blackmagic Cinema cameras can be equipped with professional lenses of EF and ZE or MTF type bayonets. 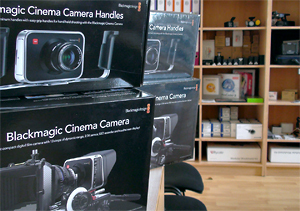 For detailed information about Blackmagic Cinema cameras, please, visit our showroom or contact our product manager. During second quarter of 2013 other tools for professional production showed notable demand as well. Lately for customers in Latvia, Estonia and Lithuania Hannu Pro supplied six JVC GY-HM600 camcorders, which are extremely popular among producers of TV programmes, several Sony HDR-AX2000 camcorders, and also a number of iMAC and Dell workstations for video editing and production applications. Other notable deliveries include Lawo audio equipment for Latvian State television, as well as pair of bulk sales of tripods and TV camera pedestals with total market value exceeding EUR 45 000, and a number of Canon EOS series cameras for video production, which were supplied to various other customers. With the introduction of new Grass Valley LDX series broadcast cameras and Dyno S replay system Hannu Pro and Grass Valley organized a special roadshow for Baltic broadcasters and content producers. Informative events were held in Tallinn, Riga, and Vilnius from June 4 to 6. Rien van Trotsenburg - senior product specialist for cameras at Grass Valley, and Kalvis Baumanis - Hannu Pro board member showed off the latest Grass Valley developments and provided detailed information about LDX series cameras and Dyno S replay system features, as well as answered questions. Attendees were able to test supplied equipment and express their interest and opinions. Events were spent successfully and helped passing relevant information about the latest technologies to decision makers and engineers of leading broadcasters in Estonia, Latvia and Lithuania. In March prominent broadcast technology magazine TVBEurope interviewed leading European System Integrators. 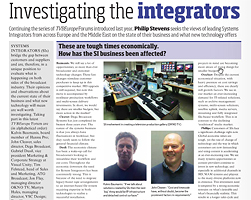 On recently introduced Forums section journalist Philip Stevens sought the views on System Integration business and new technologies. During this interview Hannu Pro board member Kalvis Baunanis kindly shared his view on following questions: These are tough times economically. How has the SI business been affected? Have there been is major changes in the way you have been asked carry your work in recent years? We tend to think of Systems Integration as 'techie'. But do you have contact with production personnel - producers, directors, PAs - concerning what they look for in the 'ideal' studio or outside broadcast truck? What impact OTT, IPTV and other 'non-traditional' broadcast technology had on your business? Are there any areas of equipment design that you feel need more development to meet current demands? What future developments/innovations will there be from Systems Integrators? 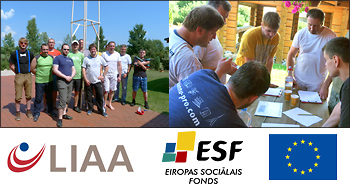 This spring Hannu Pro took part in the educational project supported by EU and European Social Fund. This project was aimed to foster employees' knowledge and skills in communication and collaboration. Latvian Computer Technologies Association (Biedrîba Latvijas Datortehnoloìiju asociâcija) in cooperation with Investment and Development Agency of Latvia implemented this project and conducted three intensive training sessions, which took place in February and March. In first two sessions employees gained theoretical knowledge, whereas during the last session they learned how to use their new knowledge. Teambuilding training sessions gave employees new experience and helped advancing their skills, as well as increased competitiveness of whole Hannu Pro team. NAB - the annual broadcasting technology forum is due in April in Las Vegas. Grass Valley has already announced some exciting products, which mark new horizons for further developments and take content production (image acquisition and mixing) to the next level. 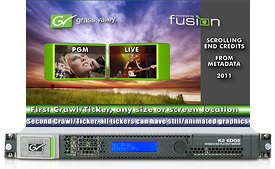 Most notable of new Grass Valley developments are GV Director - an integrated non-linear production system, a reinvented video mixer and production switcher, offering new approach to content production and innovative user interface; LDX Flex - new affordable addition to LDX series broadcast cameras, providing basic image acuisition functionality (1080i or 720p support), with wide software licence upgrade options, allowing to upgrades to full LDX Premiere, LDX Elite or LDX WorldCam functionality; XCU - new exchangeable camera base station to remotely control LDX and LDK series broadcast cameras and support signal flow up to 3Gbps, which also, thanks to modular cradle design, allow flexible mobile re-connections to the racks according to the production needs; new version of the Stratus advanced production platform, as well as other storage and multi-viewer solutions. Stay tuned for more. In December Grass Valley organized a special indepth training session for it's image acquisition produt line - LDK and LDX series cameras. 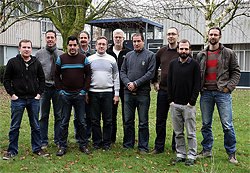 Training took place in Breda, Netherlands. 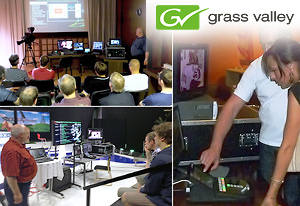 A group of nine camera support engineers from several companies and different countries (Netherlands, Germany, Portugal, Estonia, Ukraine and Croatia) spent four days at Grass Valley Engineering centre learning indepth features of both Grass Valley LDK and the new LDX broadcast cameras. Pent Annert - General Manager of Hannu Pro Tallinn also took part in this training session. Training was organized with te aim to strengthen the technical knowledge and foster skills of engineers providing local technical support for Grass Valley imaging product customers. Training was conducted by Jan Paul Campman - Grass Valley Technical Trainer.